Starting a small business is never easy and business owners throughout the country know it takes a lot of hard work, determination and grit to get where you are today. No one knows that better than our coaches, who’ve had their own experiences working in and with companies in Middletown, NY, Scranton, PA and Paramus, NJ! Competition can be fierce but even the best business owners can benefit from business consulting for small businesses! If up until now you have believed that business coaching is a luxury enjoyed by large corporations and not appropriate for smaller businesses, you should know that nothing could be further from the truth. Coachfirm’s services can easily pay for themselves in the opportunities they can provide your business to grow and thrive. It’s the Cinderella story many small business owners dream of: A high-functioning, smoothly-run store or service where sales are strong, employees are great, the budget is green and your talents and vision have come to life. All that time, money, sweat and labor you’ve invested has paid off. You’ve bibbidi-bobbidi-booped your way to business success, and you couldn’t wish for a better life on any star. But for most small business owners, this is still the fantasy — not the reality. And that is by no personal shortcomings of your own. In a world where half of small businesses close shop in less than five years, the notion of a business “fairy godmother” to help solve your most pressing problems and steer your way to success is more attractive than ever. It’s also something that’s attainable — and not in a fantasy, either, but through the real, grounded expertise and services of personal business coaching and mentoring. First Things First: What Is a Business Coach? Business coaches exist to serve one central duty: to help you meet your business goals. If this sounds too simplistic, think again. The myriad of roles you play as the owner of a small business means you have to do everything, from sales, marketing, promotions, technology and human resources to talent acquisition, finance, project management, strategic planning and more. In other ventures, these responsibilities are usually sprinkled across different departments. Small business owners don’t have that luxury. That’s exactly where personal business coaching comes in. A small business coach devises systems and strategies to help you set and meet your diverse goals, offering mentorship to reframe how you think about your business and the tools to achieve measurable success. Cash-Flow Problems: Tied-up finances are the bane of many young businesses. When you think you’re already stretching the budget, business consultants can show you ways to trim bottom your line and streamline costs. Crisis Management or Business Transition: Unforeseen events or significant business disruptions can rock a company to its core. With one-on-one or group business coaching, you have the resources to adapt quickly. Talent Management: Hiring, managing and retaining top-tier employees is a specialized skill many business mentors readily teach. Sales and Revenue Growth: As the backbone of your small business, coaches work tirelessly to package individual strategies to boost your brand awareness, reach, customer conversions and end-of-day profits. Process Improvements: Creating operations and systems that work for your small business is key to its smooth sailing — and your sanity. Personal Accountability: More often than not, small business owners can just get overwhelmed. We all need someone to listen to us and provide advice. Business coaching services provide the scaffolding, direction and accountability to turn yesterday’s habits into tomorrow’s opportunities. Those Looking to Strengthen General Business Acumen: There is so much to learn when you run your own business. Those looking to sharpen their skills, develop new practices or get up-to-date with the most current business methods turn to business consultants to do so. When you hire a business coach, you hire someone proficient in organizational structure, business department operations and even psychological motivations. Your success is theirs, and they work with you across a set timeframe to outline specific goals and create a proactive strategic plan. Typically, working with a business coach happens in five steps. It is vital for you to research consultants familiar with your small business industry. Likewise, you should have a sense of the targeted business goals you want to accomplish, whether that’s increased sales, better finance management or maybe a little bit of everything. Many business coaching services employ a free, no-risk consultation to get an overview of your needs and see if they’ll make a good match. This starts the conversation on expectations, roles and end goals to transform your business — and yourself. Once you’ve found the right partner whose expertise aligns with your needs, small business coaching services move on to creating your contract action plan or program. Action programs are your roadmap. They are the proprietary tools to help you achieve goals and see desired, measurable results strategized through individualized business assessments, data collection, observation and meetings between you and your coach. The meat and potatoes of your partnership, a business coach will regularly meet with you to implement and oversee your action program from A to Z. They will set up learning sessions, administer workshops and provide ongoing mentorship until your small business sees real development. This step involves the evaluation of your small business’s progress, including quantifiable results to prove how you’ve addressed your pain points and cultivated growth. You are now equipped with the tools, skills and resources to take your small business to the next level. Two types of small business consulting programs are on the market: one-on-one and group business coaching. Individual coaching is, well, as its name implies. You work, meet and interact with your coach or consultant in reoccurring, one-on-one settings — in-person or online — to work through your administered program. Group coaching offers a class-like approach to addressing small business pain points and developing business owner skills. You can enact group coaching internally amongst your team, or sign up for public sessions where other business owners experiencing challenges similar to yours can learn and grow as a community. The length of business coaching programs depends on your unique goals, current business challenges and desired level of service. A typical program can run anywhere from 90 days to 12 months. Likewise, you can tailor the sessions or meetings that make up a significant aspect of personal business coaching to your schedule. While once-a-week, hour-long sessions are the norm, you can arrange for shorter conferences or more extended, topical meetings upon request — it’s all about what you arrange with your coach. Similar to the length of a program, the cost for your business coach will vary. In a survey conducted by the International Coach Federation, 89 percent of small business owners who’d contracted an industry business coach saw a return on investment for the service. Some business coaches near you may charge by the hour. While this isn’t the most common fee structure, it could be an attractive option for smaller, team-based or situational workshops. 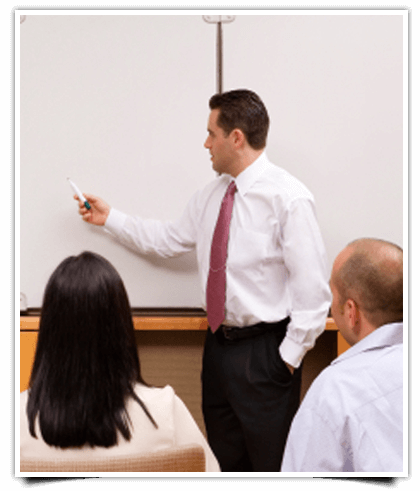 For small business coaching that’s session-heavy, many professionals charge by the workshop. Average market prices range from $175 to $400 per session. Business coaching professionals could also opt to charge based on your entire package of devised mentorship services, which you may pay for in bulk or installments. Certain types of business coaches also charge a “back-end percentage” fee, meaning they earn a percentage of the sales growth — anywhere from three to 25 percent — that you made as a result of their services. For exact business coach packages and pricing or group coaching fees, never be afraid to reach out to a firm directly. After all, these professionals exist to answer your questions and help your business thrive. What Are the Benefits of Hiring a Small Business Coach? Business coaching benefits are hardly empty marketing ploys. Coaches come with dozens of years of experience under their belts across many business domains, as well as training, administrative and management expertise. Your coach is there for one purpose — to tailor actionable, practical and cohesive strategies to see the entirety of your small business flourish. Those strategies break down into many tangible benefits, including these five. Small business owners get pulled in every direction over the course of a day. What’s more, it’s natural for one to feel comfortable in say, marketing initiatives, but maybe not so much in balancing the spreadsheets or onboarding new employees. Small business coaching services ensure underdeveloped domains don’t keep slipping through the cracks. You can find small business coaching specialties in sales, operations, finance, employee management, project management, IT and more. Or you can opt for a general practitioner to tighten up your entire small-business ship. No more business drifting. No more day-to-day operations lacking a strategic pulse. This kind of small-business mentality is not only shapeless — it sabotages your short- and long-term potential. When you hire a business coach, you’re hiring a strategic mind to build a framework that turns your ideas into goals. You then map out those goals, set timelines and outline the functional details needed to check them off one by one. It happens to the best of us. Small business owners can be so intimately involved and acquainted with their business that they can’t pull back to look at problems and ideate solutions from any other angle. New minds on old problems unlock fresh possibilities. This is precisely what tailored business coaching methods aim to deliver, without mincing words or lending biased opinions. There’s no shortage of hats to wear when it comes to running a small business — and as the owner, you don them all. Whether it’s sloppy supply chain management, marketing stagnation, low customer retention, budget management or any woe in between, business coaching helps you overcome your process pain points. Family-run businesses or companies started amongst friends or partners involve a whole new set of challenges. Business coaches can also act as mediators to work through interpersonal issues while teaching conflict-resolution strategies, so they don’t arise again. Running a small business is a roller coaster — some days are up, some days are down. It’s easy to feel alone in the free fall and let your thoughts run amok, wondering why you ever started this endeavor in the first place. Yes, business coaches offer tactical solutions and skill sets, but they’re also one-of-a-kind mentors — someone to confide in and pull insights from during tough times. Personal business coaches arm you with new proficiencies while reminding you that you have what it takes, even when you might not believe it. If you’re wondering how to measure coaching effectiveness, know that it goes beyond calculating your return on investment. Yes, numbers certainly don’t lie. Neither do the feelings of confidence, self-awareness of technical savvy following your participation in a business coaching program. Quarter-on-quarter analyses compare finances from the previous quarter with the current one. For business owners who outline sales and revenue growth as a significant goal across business strategy consulting, a QoQ report is a crucial metric to track program effectiveness. Similarly, a year-on-year analysis can prove longer-term revenue growth and financial stability. You’ll be even more aware of personal and professional changes that have occurred over the course of a single year and feel motivated for greater financial achievements next. Another overlooked benefit to business consultants? They’ll push you out of your comfort zone — your networking comfort zone, that is. Whether it is a preconceived part of your sessions or a byproduct of your hard work, you will likely grow your business and deepen community connections over the course of your program. Industry professionals agree that 360 Degree Feedback models are an excellent tool for employee development. They glean performance feedback from customers, co-workers and managers alike, offering a full look into how you’ve personally developed after your business coaching action plan concludes. Streamlined business operations are yet another numbers-backed record of your work. Did you implement new software that made accounting tasks easier? Did you develop and lead a new set of employee training modules? Did you cut order lead times by 15 percent? Any related process improvements are significant accomplishments signaling your business’ maturity. Those initial goals you discussed with your small business coach? They weren’t just abstract wishes — they are the actual metrics fueling action plans, weekly meetings and program sessions. At the end of your mentorship timeline, how many did you check off — and did they open doors to new business goals and future potential? Hopefully, you can check yes to those questions, as well. Is Business Coaching Right for Your Small Business? While we certainly work with many larger businesses, small businesses are a large segment of the population we collaborate with, and we understand the specific challenges and issues small businesses face. Our experts will talk with you, assess your business and quickly design a plan that will help you tackle those areas of weakness that may be holding you back. If you need a financial coach for business who can help you manage cash flow, eliminate wastefulness and find ways to increase your bottom line, we can offer financial consulting services. But our small business consulting solutions are so much more than that. We can help you with developing a marketing plan, improving employee morale, recruiting talent, leadership development, defining your company’s mission and much more. There’s no reason to hold your business back from its true potential — and yourself from being the business leader you’ve always wanted to be. When you partner with business coaching and mentoring experts like Coachfirm, your small-business needs become our own. We hold a unique, multi-disciplined approach to our small business clients. Combining many proven business coaching methods with personal and professional growth strategies, we promise that where you see problems, we see possibilities. Contact Coachfirm to Start Enjoying the Benefits of Expert Coaching for Your Small Business Today! Coachfirm provides a variety of consulting services for your small business nationwide and in surrounding hometown areas like Paramus, NJ, Scranton, PA and Middletown, NY. Whether your business has hit a speed bump or it’s doing great, and you’re ready to take it to the next level, we have a plan for you. We can assist you with great advice, motivational techniques, accountability and more. Coachfirm has more than 100 years of combined business experience at our disposal and a proprietary system of coaching called Bizpods® that is the talk of the business world. If you want to find out how quality coaching can help your small business succeed like never before, it won’t cost you a dime. Contact us today, and we will set up a completely free consultation call to give you a taste of just what we can do for your company. Can your company benefit from quality small business coaching? Absolutely. Coachfirm is so confident in our ability to help you that we don’t ask you to sign any long-term contract, and the first call is free. Your success is our success, and we can’t wait to get started. Contact Coachfirm today to learn how our in-person and remote programs can unlock the business maestro in you. You can also schedule your free consultation call right now! "After sixteen years in business, my partner and I thought we understood our company, our market and ourselves. It took Bob's strategy to show us how much we didn't know then and how much we are certain about now." Bob has helped us grow both professionally and personally by opening our eyes to different approaches to management. We have worked hand in hand to institute strategic changes and have seen a steady increase in our productivity, profitability and peace of mind. Bob's goal is success for you in business and in life. Your book, Small Business Pain Relief, is absolutely terrific. This book should really get to be on the NY Times Bestseller list! It is because of Bob Scott that I have achieved balance and happiness in my work and personal life–for the first time I can remember.